"Wiener-Dog" redirects here. For the 2016 American comedy film, see Wiener-Dog (film). The dachshund (UK: /ˈdakshʊnd/ or US: /ˈdɑːkshʊnt/ DAHKS-huunt  or /ˈdɑːksənt/; English: badger dog; also known as the sausage dog or wiener dog) is a short-legged, long-bodied, hound-type dog breed. They may be smooth-haired, wire-haired, or long-haired. 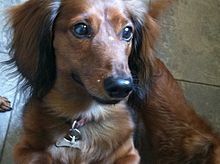 The standard-size dachshund was developed to scent, chase, and flush out badgers and other burrow-dwelling animals, while the miniature dachshund was bred to hunt smaller prey such as rabbits. In the Western United States, they have also been used to track wounded deer and hunt prairie dogs. The name dachshund is of German origin and literally means "badger dog," from Dachs ("European badger") and Hund ("hound, dog"). The pronunciation varies widely in English: variations of the first and second syllables include /ˈdɑːks-/, /ˈdæks-/ and /-hʊnt/, /-hʊnd/, /-ənd/. Although "dachshund" is a German word, in modern German they are more commonly known by the short name Dackel or Teckel. The German word is pronounced [ˈdaks.hʊnt]. 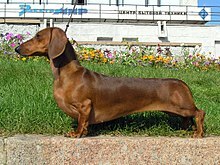 Because of their long, narrow build, they are often nicknamed wiener dog or sausage dog. Dachshund may be mispronounced as "dash-hound" by some English speakers. While classified in the hound group or scent hound group in the United States and Great Britain, the breed has its own group in the countries which belong to the Fédération Cynologique Internationale (World Canine Federation). Many dachshunds, especially the wire-haired subtype, may exhibit behavior and appearance that are similar to that of the terrier group of dogs. An argument can be made for the scent (or hound) group classification because the breed was developed to use scent to trail and hunt animals, and probably descended from the Saint Hubert Hound like many modern scent hound breed such as bloodhounds and Basset Hounds; but with the persistent personality and love for digging that probably developed from the terrier, it can also be argued that they could belong in the terrier, or "earth dog", group. A typical dachshund is long-bodied and muscular with short stubby legs. Its front paws are disproportionately large, being paddle-shaped and particularly suitable for digging. Its skin is loose enough not to tear while tunneling in tight burrows to chase prey. The dachshund has a deep chest which provides appropriate lung capacity for stamina when hunting. Its snout is long. According to the AKC standards for the breed, "scars from honorable wounds shall not be considered a fault" because the dachshund is a hunting dog. There are three dachshund coat varieties: smooth coat (short hair), longhaired, and wirehaired. Longhaired dachshunds have a silky coat and short featherings on legs and ears. 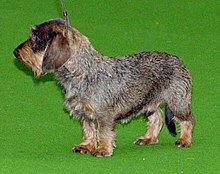 Wirehaired dachshunds are the least common coat variety in the United States (although it is the most common in Germany) and the most recent coat to appear in breeding standards. Dachshunds have a wide variety of colors and patterns, the most common one being red. Their base coloration can be single-colored (either red or cream), tan pointed (black and tan, chocolate and tan, blue and tan, or isabella and tan), and in wirehaired dogs, a color referred to as wildboar. Patterns such as dapple (merle), sable, brindle and piebald also can occur on any of the base colors. Dachshunds in the same litter may be born in different coat colors depending on the genetic makeup of the parents. The dominant color in the breed is red, followed by black and tan. Tan pointed dogs have tan (or cream) markings over the eyes, ears, paws, and tail. The reds range from coppers to deep rusts, with or without somewhat common black hairs peppered along the back, face and ear edges, lending much character and an almost burnished appearance; this is referred to among breeders and enthusiasts as an "overlay" or "sabling". Sabling should not be confused with a more unusual coat color referred to as sable. At a distance, a sable dachshund looks somewhat like a black and tan dog. Upon closer examination, however, one can observe that along the top of the dog's body, each hair is actually banded with red at the base near the skin transitioning to mostly black along the length of the strand. An additional striking coat marking is the brindle pattern. "Brindle" refers to dark stripes over a solid background—usually red. If a dachshund is brindled on a dark coat and has tan points, it will have brindling on the tan points only. Even one single, lone stripe of brindle is a brindle. If a dachshund has one single spot of dapple, it is a dapple. The Dachshund Club of America (DCA) and the American Kennel Club (AKC) consider both the piebald pattern and the double dapple (double merle) pattern to be nonstandard. However, both types continue to be shown and sometimes even win in the conformation ring. Dogs that are double-dappled have the merle pattern of a dapple, but with distinct white patches that occur when the dapple gene expresses itself twice in the same area of the coat. The DCA excluded the wording "double-dapple" from the standard in 2007 and now strictly use the wording "dapple" as the double dapple gene is commonly responsible for blindness and deafness. Black and Tan Dapple dachshund. Dachshunds come in three sizes: standard, miniature, and kaninchen (German for "rabbit"). Although the standard and miniature sizes are recognized almost universally, the rabbit size is not recognized by clubs in the United States and the United Kingdom. The rabbit size is recognized by the Fédération Cynologique Internationale (World Canine Federation) (FCI), which contain kennel clubs from 83 countries all over the world. An increasingly common size for family pets falls between the miniature and the standard size, frequently referred to as "tweenies," not an official classification. A full-grown standard dachshund averages 16 lb (7.3 kg) to 32 lb (15 kg), while the miniature variety normally weighs less than 12 lb (5.4 kg). The kaninchen weighs 8 lb (3.6 kg) to 11 lb (5.0 kg). According to kennel club standards, the miniature (and kaninchen, where recognized) differs from the full-size only by size and weight, thus offspring from miniature parents must never weigh more than the miniature standard to be considered a miniature as well. While many kennel club size divisions use weight for classification, such as the American Kennel Club, other kennel club standards determine the difference between the miniature and standard by chest circumference; some kennel clubs, such as in Germany, even measure chest circumference in addition to height and weight. H. L. Mencken said that "A dachshund is a half-dog high and a dog-and-a-half long," although they have been referred to as "two dogs long". This characteristic has led them to be quite a recognizable breed, and they are featured in many a joke and cartoon, particularly The Far Side by Gary Larson. Light-colored dachshunds can sport amber, light brown, or green eyes; however, kennel club standards state that the darker the eye color, the better. Dapple and double dapple dachshunds can have multi coloured “wall”eyes with fully blue, partially blue or patched irises due to the effect of the dapple gene on eye pigmentation expression. “Wall” eye is permissible according to DCA standards but undesirable by AKC standards. Piebald-patterned dachshunds will never have blue in their eyes, unless the dapple pattern is present. Being the owner of dachshunds, to me a book on dog discipline becomes a volume of inspired humor. Every sentence is a riot. Some day, if I ever get a chance, I shall write a book, or warning, on the character and temperament of the dachshund and why he can't be trained and shouldn't be. I would rather train a striped zebra to balance an Indian club than induce a dachshund to heed my slightest command. When I address Fred I never have to raise either my voice or my hopes. He even disobeys me when I instruct him in something he wants to do. Dachshunds can be aggressive to strangers and other dogs. Despite this, they are rated in the intelligence of dogs as an average working dog with a persistent ability to follow trained commands 50% of the time or more. They rank 49th in Stanley Coren's Intelligence of Dogs, being of average working and obedience intelligence. They can have a loud bark. Some bark quite a lot and may need training to stop, while others will not bark much at all. Dachshunds are known for their devotion and loyalty to their owners, though they can be standoffish towards strangers. If left alone too frequently, some dachshunds are prone to separation anxiety and may chew objects in the house to relieve stress. Dachshunds can be difficult to housebreak, and patience and consistency is often needed in this endeavor. According to the American Kennel Club's breed standards, "the dachshund is clever, lively and courageous to the point of rashness, persevering in above and below ground work, with all the senses well-developed. Any display of shyness is a serious fault." Their temperament and body language give the impression that they do not know or care about their relatively small size. Like many small hunting dogs, they will challenge a larger dog. Indulged dachshunds may become snappy or extremely obstinate. Many dachshunds do not like unfamiliar people, and many will growl or bark at them. Although the dachshund is generally an energetic dog, some are sedate. This dog's behavior is such that it is not the dog for everyone. A bored, untrained dachshund will become destructive. If raised improperly and not socialized at a young age, dachshunds can become aggressive or fearful. They require a caring, loving owner who understands their need for entertainment and exercise. Dachshunds may not be the best pets for small children. Like any dog, dachshunds need a proper introduction at a young age. Well trained dachshunds and well-behaved children usually get along fine. Otherwise, they may be aggressive and bite an unfamiliar child, especially one that moves quickly around them or teases them. However, many dachshunds are very tolerant and loyal to children within their family, but these children should be mindful of the vulnerability of the breed's back. A 2008 University of Pennsylvania study of 6,000 dog owners who were interviewed indicated that dogs of smaller breeds were more likely to be "genetically predisposed towards aggressive behaviour". Dachshunds were rated the most aggressive, with 20% having bitten strangers, as well as high rates of attacks on other dogs and their owners. The study noted that attacks by small dogs were unlikely to cause serious injuries and because of this were probably under-reported. The breed is prone to spinal problems, especially intervertebral disk disease (IVDD), due in part to an extremely long spinal column and short rib cage. The risk of injury may be worsened by obesity, jumping, rough handling, or intense exercise, which place greater strain on the vertebrae. About 20–25% of dachshunds will develop IVDD. Treatment consists of combinations of crate confinement and courses of anti-inflammatory medications (steroids and non-steroidal anti-inflammatory drugs like carprofen and meloxicam), or chronic pain medications, like tramadol. Serious cases may require surgery to remove the troublesome disk contents. A dog may need the aid of a cart to get around if paralysis occurs. A minimally invasive procedure called "percutaneous laser disk ablation" has been developed at the Oklahoma State University Veterinary Hospital. Originally, the procedure was used in clinical trials only on dachshunds that had suffered previous back incidents. Since dachshunds are prone to back issues, the goal is to expand this treatment to dogs in a normal population. In addition to back problems, the breed is prone to patellar luxation where the kneecap can become dislodged. Dachshunds may also be affected by Osteogenesis imperfecta (brittle bone disease). The condition seems to be mainly limited to wire-haired Dachshunds, with 17% being carriers. A genetic test is available to allow breeders to avoid breeding carriers to carriers. In such pairings, each puppy will have a 25% chance of being affected. In some double dapples, there are varying degrees of vision and hearing loss, including reduced or absent eyes. Not all double dapples have problems with their eyes and/or ears, which may include degrees of hearing loss, full deafness, malformed ears, congenital eye defects, reduced or absent eyes, partial or full blindness, or varying degrees of both vision and hearing problems; but heightened problems can occur due to the genetic process in which two dapple genes cross, particularly in certain breeding lines. Dapple genes, which are dominant genes, are considered "dilution" genes, meaning whatever color the dog would have originally carried is lightened, or diluted, randomly; two dominant "dilution" genes can cancel each other out, or "cross", removing all color and producing a white recessive gene, essentially a white mutation. When occurring genetically within the eyes or ears, this white mutation can be detrimental to development, causing hearing or vision problems. Other dachshund health problems include hereditary epilepsy, granulomatous meningoencephalitis, dental issues, Cushing's syndrome, thyroid and autoimmune problems, various allergies and atopies, and various eye conditions including cataracts, glaucoma, progressive retinal atrophy, corneal ulcers, nonucerative corneal disease, sudden acquired retinal degeneration, and cherry eye. Dachshunds are also 2.5 times more likely than other breeds of dogs to develop patent ductus arteriosus, a congenital heart defect. Dilute color dogs (Blue, Isabella, and Cream) are very susceptible to Color Dilution Alopecia, a skin disorder that can result in hair loss and extreme sensitivity to sun. Since the occurrence and severity of these health problems is largely hereditary, breeders are working to eliminate these. Factors influencing the litter size of puppies and the proportion of stillborn puppies per litter were analyzed in normally sized German dachshunds. The records analyzed contained data on 42,855 litters. It was found that as the inbreeding coefficient increased, litter size decreased and the percentage of stillborn puppies increased, thus indicating inbreeding depression. It was also found that young and older dams had smaller litter sizes and more stillborn puppies than middle-aged dams. Some writers and dachshund experts have theorized that the early roots of the dachshund go back to ancient Egypt, where engravings were made featuring short-legged hunting dogs. Recent discoveries by the American University in Cairo of mummified dachshund-like dogs from ancient Egyptian burial urns may lend credibility to this theory. In its modern incarnation, the dachshund is a creation of German breeders and includes elements of German, French, and English hounds and terriers. Dachshunds have been kept by royal courts all over Europe, including that of Queen Victoria, who was particularly enamored of the breed. The first verifiable references to the dachshund, originally named the "Dachs Kriecher" ("badger crawler") or "Dachs Krieger" ("badger warrior"), came from books written in the early 18th century. Prior to that, there exist references to "badger dogs" and "hole dogs", but these likely refer to purposes rather than to specific breeds. The original German dachshunds were larger than the modern full-size variety, weighing between 14 and 18 kg (31 and 40 lb), and originally came in straight-legged and crook-legged varieties (the modern dachshund is descended from the latter). 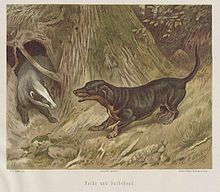 Though the breed is famous for its use in exterminating badgers and badger-baiting, dachshunds were also commonly used for rabbit and fox hunting, for locating wounded deer, and in packs were known to hunt game as large as wild boar and as fierce as the wolverine. The flap-down ears and famous curved tail of the dachshund have deliberately been bred into the dog. In the case of the ears, this is to keep grass seeds, dirt, and other matter from entering the ear canal. The curved tail is dual-purposed: to be seen more easily in long grass and, in the case of burrowing dachshunds, to help haul the dog out if it becomes stuck in a burrow. The smooth-haired dachshund, the oldest style, may be a cross between the German Shorthaired Pointer, a Pinscher, and a Bracke (a type of bloodhound), or to have been produced by crossing a short Bruno Jura Hound with a pinscher. 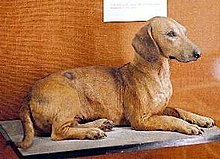 Others believe it was a cross from a miniature French pointer and a pinscher; others claim that it was developed from the St. Hubert Hound, also a bloodhound, in the 18th century, and still others believe that they were descended from Basset Hounds, based upon their scent abilities and general appearance. Daschshunds can track a scent that is more than a week old. The exact origins of the dachshund are therefore unknown. According to William Loeffler, from The American Book of the Dog (1891), in the chapter on dachshunds: "The origin of the Dachshund is in doubt, our best authorities disagreeing as to the beginning of the breed." What can be agreed on, however, is that the short-haired dachshund gave rise to both the long-haired and the wire-haired varieties. 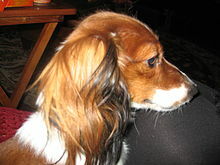 There are two theories about how the standard longhair dachshund came about. One theory is that smooth Dachshunds would occasionally produce puppies which had slightly longer hair than their parents. By selectively breeding these animals, breeders eventually produced a dog which consistently produced longhair offspring, and the longhair dachshund was born. Another theory is that the standard longhair dachshund was developed by breeding smooth dachshunds with various land and water spaniels. The long-haired dachshund may be a cross among any of the small dog breeds in the spaniel group, including the German Stoeberhund, and the smooth-haired dachshund. Dachshunds have traditionally been viewed as a symbol of Germany. Political cartoonists commonly used the image of the dachshund to ridicule Germany. During World War I the dachshunds' popularity in the United States plummeted because of this association. As a result, they were often called "liberty hounds" by their owners similar to "liberty cabbage" becoming a term for sauerkraut mostly in North America. The stigma of the association was revived to a lesser extent during World War II, though it was comparatively short-lived. Kaiser Wilhelm II and German Field Marshal Erwin Rommel were known for keeping dachshunds. Due to the association of the breed with Germany, as well as its particular popularity among dog keepers in Munich back then, the dachshund was chosen to be the first official mascot for the 1972 Summer Olympics in Munich, with the name Waldi. Some people train and enter their dachshund to compete in dachshund races, such as the Wiener Nationals. Several races across the United States routinely draw several thousand attendees, including races in Germantown, Tennessee; Bossier City, Louisiana; Buda, Texas; Davis, California; Phoenix, Arizona; Los Alamitos, California; Findlay, Ohio; Milwaukee, Wisconsin; Oklahoma City, Oklahoma; Kansas City, Kansas; Palo Alto, California; Shakopee, Minnesota. There is also an annual dachshund run in Kennywood, located in Pittsburgh, Pennsylvania, called the Wiener 100, in Huntington, West Virginia called the Dachshund Dash and in Lovettsville, Virginia as part of the town's annual Oktoberfest celebration. Despite the popularity of these events, the Dachshund Club of America opposes "wiener racing", as many greyhound tracks use the events to draw large crowds to their facilities. The DCA is also worried about potential injuries to dogs, due to their predisposition to back injuries. Another favorite sport is earthdog trials, in which dachshunds enter tunnels with dead ends and obstacles attempting to locate an artificial bait or live but caged and protected rats. In Germany, dachshunds are widely called Dackel (both singular and plural). Among hunters, they are mainly referred to as Teckel. There are kennels which specialize in breeding hunting dachshunds, the so-called jagdliche Leistungszucht ("hunting-related performance breed") or Gebrauchshundezucht ("working dog breed"), as opposed to breeding family dogs. Therefore, it is sometimes incorrectly believed that Teckel is either a name for the hunting breed or a mark for passing the test for a trained hunting dog (called "VGP", "Verband-Gebrauchsprüfung") in Germany. Dachshunds are one of the most popular dogs in the United States, ranking 13th in the 2016 AKC registration statistics. They are popular with urban and apartment dwellers, ranking among the top ten most popular breeds in 76 of 190 major US cities surveyed by the AKC. One will find varying degrees of organized local dachshund clubs in most major American cities, including New York, New Orleans, Portland, Los Angeles, and Chicago. How will it end? Wie wird es enden? c. 1900. German postcard with inscription "This beer belongs to my master!" c. 1900. John F. Kennedy bought a dachshund puppy while touring Europe in 1937 for his then girlfriend Olivia. The puppy, named Dunker, never left Germany after Kennedy started to get allergic reactions. Grover Cleveland, the 22nd and 24th President, had a dachshund in the White House. William Randolph Hearst was an avid lover of dachshunds. When his own dachshund Helena died, he eulogized her in his "In The News" column. Fred, E.B. White's dachshund, appeared in many of his famous essays. Lump, the pet of Pablo Picasso, who was thought to have inspired some of his artwork. (Pronounced: loomp; German for "Rascal") Picasso & Lump: A Dachshund's Odyssey tells the story of Picasso and Lump. Jack Ruby, the killer of Lee Harvey Oswald, had a dachshund named Sheba, which he often referred to as his wife. At the time he murdered Oswald, he had four of them—although he once had as many as 10. Andy Warhol had a pair of dachshunds, Archie and Amos, whom he depicted in his paintings and mentioned frequently in his diaries. Stanley and Boodgie, immortalized on canvas by owner David Hockney, and published in the book David Hockney's Dog Days. Wadl and Hexl, Kaiser Wilhelm II's famous ferocious pair. Upon arriving at Archduke Franz Ferdinand's country seat, château Konopiště, on a semi-official visit, they promptly proceeded to do away with one of the Austro-Hungarian heir presumptive's priceless golden pheasants, thereby almost causing an international incident. Another one of his beloved dachshunds, Senta, is currently buried at Huis Doorn, Wilhelm's manor in the Netherlands. Donald Rumsfeld was asked, in 2003, whether he had duct tape, plastic sheeting, and a three-day supply of bottled water at home. He replied, "I would like to say I did. I don't believe we do. But I do have a miniature dachshund named Reggie who looks out for us." In Zelenogorsk, Russia, a parade of Dachshunds pass by a Dachshund monument every July 25 to commemorate the day the city was founded. Joe was the dachshund of General Claire Lee Chennault, commander of the Flying Tigers and then the China Air Task Force of the US Army Air Forces, and became the mascot of those organizations. 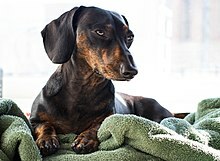 Maxie, a dachshund owned by actress Marie Prevost, tried to awaken his dead mistress, who was found with small bites on her legs. Maxie's barking eventually summoned neighbours to the scene. The incident inspired the 1977 Nick Lowe song "Marie Prevost". Liliane Kaufmann, wife of Edgar J. Kaufmann who commissioned the home Fallingwater from Frank Lloyd Wright in 1935, was a well known breeder and owner of long-haired dachshunds. At the Fallingwater bookstore, visitors are able to purchase a book titled "Moxie" which is about one of the dachshunds who lived at Fallingwater. 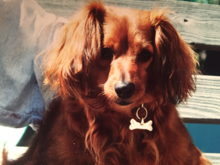 Liliane raised long haired dachshunds and they travelled from Pittsburgh to Bear Run with her. Obie is a dachshund who became infamous for his obesity, weighing as much as 77 pounds (35 kilograms), more than twice a normal-weight standard dachshund. He reached his target weight of 28 lb (13 kg) in July 2013. Carole Lombard and Clark Gable had a dachshund named Commissioner. ^ "Individual Breed Results for Purebred Dog Health Survey". The Kennel Club. 2006. Retrieved 26 November 2015. ^ "Oxford English Dictionary". Oxford English Dictionary. Oxford University Press. Retrieved 13 April 2018. ^ "American Rare Breed Associations Groups". ARBA Web. American Rare Breed Association (ARBA). Retrieved 17 June 2018. ^ "Dachshund – Definition and More from the Free Merriam-Webster Dictionary". Merriam-webster.com. Retrieved 16 May 2012. ^ "AKC Dog Registration Statistics". American Kennel Club. Retrieved 11 December 2017. ^ "Dachshund". Duden. Retrieved 25 November 2012. ^ "We Can't Stop Staring at This Wiener Dog That Had to Be 'Deflated'". Vice. 1 June 2018. Retrieved 16 June 2018. ^ "WEIner vs. WIEner and Other Nicknames for a Dachshund". YouDidWhatWithYourWiener.com. 21 January 2018. Retrieved 16 June 2018. ^ "Fédération Cynologique Internationale Group 4 "Dachshund Group"". Fédération Cynologique Internationale. Archived from the original on 15 August 2009. Retrieved 16 June 2009. ^ a b Nicholas, Anna (1987). Dachshund. Neptune City: TFH Publications. p. 10. ISBN 0-86622-158-1. ^ a b "A Brief History of the Breed". AlmostHomeRescue.org. Retrieved 16 June 2009. ^ "American Kennel Club Official Standard of the Dachshund" (PDF). akc.org. Retrieved 11 December 2017. ^ a b c d e "Dachshund Breed Standard". American Kennel Club. Retrieved 3 February 2009. ^ "Fédération Cynologique Internationale Official Website". Fédération Cynologique Internationale. Retrieved 16 June 2009. ^ Hutchinson, Robert (2005). For the Love of Dachshunds. BrownTrout Publishers. p. 112. ISBN 1-56313-903-0. Retrieved 16 June 2009. ^ "Quote Daddy". Retrieved 16 June 2009. ^ "Dachshund Poetry". QuotesDaddy.com. Retrieved 16 June 2009. ^ Larson, Gary (1990). Wiener Dog Art: A Far Side Collection. Andrews McMeel Publishing. ISBN 0-8362-1865-5. ^ "The Double Dapple". The Dachshund Magazine Online. Retrieved 25 June 2007. ^ "Dachshund". Retrieved 26 November 2012. ^ a b c d Stall, Sam (2005). The Good, the Bad, and the Furry. Quirk Books. pp. 93–94. ISBN 1-59474-021-6. ^ a b c d e f g Kilcommons, Brian; Wilson, Sarah. Paws to Consider. pp. 156–157. ISBN 0-446-52151-5. ^ a b c d "Dachshund info". Retrieved 25 July 2009. ^ a b c d e "Is a Dachshund Right For You". WienerDogRescue.com. Retrieved 25 July 2009. ^ "Frequently Asked Questions". DachshundRescue.org. Retrieved 25 July 2009. ^ "Dachshund Facts". 3doxies.com. Retrieved 8 April 2011. ^ a b c d "History and Development". Dachshund Club of America. Retrieved 16 June 2009. ^ Goodman, Jack (1947). The Fireside Book of Dog Stories. University of California: Cassell and Co. p. 591. ^ Busby, Mark; Dixon, Terrell (2007). "Of Dachshunds and Dashes: Subjects and Style in E.B. White and John Graves, by Dickie Maurice Heaberlin". John Graves, Writer. Published by University of Texas Press. p. 266. ISBN 0-292-71494-7. ^ Duffy, Deborah; et al. (2008). "Breed Differences in Canine Aggression". Applied Animal Behaviour Science. 114 (3–4): 441. doi:10.1016/j.applanim.2008.04.006. ^ Coren, Stanley (2006). The intelligence of dogs. Free press. ISBN 0-7432-8087-3. ^ "Physical Characteristics and Temperament". Dachshund Club of America. Retrieved 25 July 2009. ^ "Things You Need To Know about Adopting a Dachshund!". Nebraska Dachshund Rescue. Retrieved 19 November 2009. ^ "Dachshund Breed Standard". American Kennel Club. Retrieved 14 May 2007. ^ "Dachshunds". Burke's Backyard with Don Burke. Retrieved 14 May 2007. ^ "Disposition and temperament". Dachworld.com. Retrieved 26 July 2009. ^ Levy, Andrew (7 July 2008). "Why Sausage dogs are really just four-legged fiends". Daily Mail. London. Retrieved 19 November 2009. ^ Dobson, Roger (8 July 2008). "Sausage dogs are the most aggressive dogs". The Daily Telegraph. London. Retrieved 19 November 2009. ^ Jensen, V. F.; Ersbøll, A. K. (2000). "Mechanical Factors affecting the Occurrence of Intervertebral Disc Calcification in the Dachshund – a Population Study". Journal of Veterinary Medicine, Series A. 47 (5): 283–296. doi:10.1046/j.1439-0442.2000.00296.x. ^ "Intervertebral Disc Disease". Genetic Welfare Problems of Companion Animals. ufaw.org.uk: Universities Federation for Animal Welfare. Retrieved 10 February 2015. ^ BVSc, Dhupa; MPH, N; David, J. Waters DVM; PhD, Diplomate ACVS; -1#Sarit, Nita Glickman MS (1999). "Reoperative Neurosurgery in Dogs With Thoracolumbar Disc Disease". Veterinary Surgery. 28 (6): 421–428. doi:10.1111/j.1532-950X.1999.00421.x. PMID 10582738. ^ "On the Forefront: Prophylactic laser disk ablation in dogs at Oklahoma State University – Veterinary Medicine". 1 July 2007. Retrieved 19 November 2009. ^ a b Bartels, Kenneth E.; Higbee, Russell G.; Bahr, Robert J.; Galloway, David S.; Healey, Tiffany S.; Arnold, Christopher (15 June 2003). "Outcome of and complications associated with prophylactic percutaneous laser disk ablation in dogs with thoracolumbar disk disease: 277 cases (1992–2001)". Journal of the American Veterinary Medical Association. 222 (12): 1733–1739. doi:10.2460/javma.2003.222.1733. ^ Coile, D. Caroline; Earle-Bridges, Michelle (2005). The Dachshund Handbook. Barron's Educational Series. p. 126. ISBN 0-7641-2673-3. ^ Eckardt, J.; Kluth, S.; Dierks, C.; Philipp, U.; Distl, O. (2013). "Population screening for the mutation associated with osteogenesis imperfecta in dachshunds". Veterinary Record. 172 (14): 364. doi:10.1136/vr.101122. PMID 23315765. ^ ""Brittle Bone" Gene in Dachshunds Discovered" (PDF). Newsletter. Dachshund Club of America. Retrieved 6 April 2013. ^ Parizo, Angie. "Double Dapple Warnings". Retrieved 19 November 2009. ^ "Recessive and Dominant Genes". Weatherly's Miniature Dachshunds. Retrieved 19 November 2009. ^ a b c Adamson, Eve (2007). Dachshunds for Dummies (2nd ed.). For Dummies. p. 231. ISBN 0-470-22968-3. ^ "Immune-Mediated Thrombocytopenia". Genetic Welfare Problems of Companion Animals. ufaw.org.uk: Universities Federation for Animal Welfare. Retrieved 10 February 2015. ^ Adamson, Eve (2007). Dachshunds for Dummies (2nd ed.). For Dummies. p. 232. ISBN 0-470-22968-3. ^ Gresky C, Hamann H, Distl O (2005). "[Influence of inbreeding on litter size and the proportion of stillborn puppies in dachshunds]". Berl. Munch. Tierarztl. Wochenschr. (in German). 118 (3–4): 134–9. PMID 15803761. ^ a b c Loeffler, William (1891). "Dachshunds". In Shields, George O. (ed.). The American Book of the Dog. University of California: Cassell and Co. pp. 217–239. ^ M. Zedda, P. Manca, V. Chisu, S. Gadau, G. Lepore, A. Genovese, V. Farina (2006) "Ancient Pompeian Dogs – Morphological and Morphometric Evidence for Different Canine Populations, Anatomia, Histologia, Embryologia", Journal of Veterinary Medicine, Series C 35 (5), 319-324. ^ "Dachshund History Queen Victoria". Dachshund History Sub Category. Retrieved 3 May 2014. ^ Der vollkommene teutsche Jäger (The Complete German Hunter), Johann Friedrich von Flemming, 1719–1724, Leipzig. ^ "THE CHAMPION DACHSHUND, MANN". Forest and Stream; A Journal of Outdoor Life, Travel, Nature Study, Shooting, Fishing, Yachting (1873-1930): 149. 14 October 1875 – via ProQuest. ^ "Dachshund Breed Information: History, Health, Pictures, and more". www.easypetmd.com. Retrieved 26 March 2018. ^ "Dach-Facts: Double Dapple Health Risks" (PDF). www.dachshundbreedcouncil.org.uk. ^ "Dachshund Dog Breed Origins". 5StarDog. Retrieved 16 June 2009. ^ "Daschund - Me Puppy". 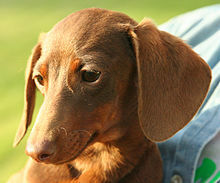 ^ "Dachshund Breed Resources". FurryCritterNetwork. Retrieved 16 June 2009. ^ "Political Cartoon for War Bonds". The New York Times. 5 April 1943. Retrieved 16 June 2009. ^ Green, Graham. A Sort of Life. pp. 49–49. ^ Whelliston, Kyle (8 July 2008). "Meet the Mascots: Waldi (Munich 1972)". Swifter Higher. Archived from the original on 8 March 2010. Retrieved 7 January 2010. ^ "Earthdog Den Trials". Canada's Guide to Dogs. Retrieved 16 June 2009. ^ "2006 AKC Top Breeds By City". American Kennel Club. ^ John F. Kennedy Presidential Library and Museum John F. Kennedy with "Dunker" during tour of Europe in the summer of 1937, The Hague, August 1937. ^ "White House Pets Menu 1850 to 1889". Presidential Pet Museum. Retrieved 30 April 2011. ^ Belozerskaya, Marina The Medici Giraffe (2006) 371. ^ "Lightness: E.B. White On Atomic Energy". Archived from the original on 20 April 2006. Retrieved 3 November 2014. ^ "Dachshunds in Pop Culture: Andy Warhol". Dachshundlove.blogspot.com. 17 November 2007. Retrieved 16 May 2012. ^ College ArchaeologyArt History HistoryRome. "David Hockney's Dog Days". Thamesandhudsonusa.com. Retrieved 16 May 2012. ^ "The Dachshund Training Advice". dogsandpuppies.co.uk. ^ Paterson, Tony (18 November 2012). "End of the line for Germany's Last Emperor". The Independent. Archived from the original on 14 December 2013. Retrieved 25 January 2014. ^ "Newsweek Article Perspectives". Newsweek Magazine. 17 March 2003. Retrieved 16 June 2009. ^ Зеленогорск отмечает 461-ю годовщину со дня основания [Zelenogorsk celebrates the 461st anniversary of its foundation]. Society (in Russian). fontanka.ru. 25 July 2009. Retrieved 6 April 2018. ^ Golden, Eve; King, Bob (2001). Golden Images: 41 Essays on Silent Film Stars. McFarland. p. 140. ISBN 0-7864-0834-0. ^ "Moxie: The Dachshund of Fallingwater". Mill Run, PA, USA: Fallingwater. Retrieved 28 November 2011. ^ "Fallingwater Facts". Fallingwater. Archived from the original on 15 April 2012. Retrieved 26 January 2017. ^ Nora Vanatta (7 September 2012). "Obese Dachshund takes on challenge of being Doxie version of 'Biggest Loser'". OregonLive.com. Retrieved 3 October 2012. ^ Medina, Sarah (10 September 2012). "Obie The Obese Dachshund: One Adorable Doxie's Mission To Lose 40 Pounds". Huffington Post. Retrieved 3 October 2012. ^ Thompson, Jeff. "Obie the Dachshund reaches goal weight". KGW.com. Retrieved 28 April 2014. ^ "A vigil for Carole". 16 January 2012. ^ "New York Times Animal Best-Sellers". The New York Times. Retrieved 6 April 2018. ^ "CRUSOE THE CELEBRITY DACHSHUND". Shorty Awards. Shorty Awards. Retrieved 6 April 2018. ^ "CRUSOE THE CELEBRITY DACHSHUND". E!Onlibe. Retrieved 9 April 2019.